SINGAPORE, Oct 5, 2016 - (ACN Newswire) - Six small and medium enterprises ("SMEs") listed on the Singapore Exchange ("SGX") presented their business strategies and investment merits today to more than a hundred investors and corporate leaders at an investment seminar jointly presented by SGX and the WeR1 Group, an Asian investor relations specialist. The seminar was held at the SGX auditorium, where Mr. Mohamed Nasser Ismail, Head of Equity Capital Markets (SME) and Head of Capital Market Development, SGX, gave an opening address. - AGV Group Limited, a leading provider of hot-dip galvanising services in Singapore, which counts many construction firms, shipyards and utilities companies as its clients (listed on SGX Catalist). - Axcelasia Inc., an integrated professional services firm that provides tax advisory, business consulting and support, and enterprise management software services (listed on SGX Catalist). - CNMC Goldmine Holdings Limited, a gold producer operating in Kelantan which is principally engaged in gold mining and exploration, as well as processing mined ore into gold dore bars (listed on SGX Catalist). - Grand Banks Yachts Limited, a renowned builder of luxury motor yachts under the Grand Banks and Palm Beach brands (listed on SGX Main Board). - Global Invacom Group Limited, a U.K.-based leading provider of fully integrated satellite communications equipment for large-scale broadcasters, among other activities (listed on SGX Main Board). - Sapphire Corporation Limited, an investment holding company specialising in metro and urban rail development in China and other emerging markets (listed on SGX Main Board). The seminar was attended by executives and professionals from listed companies, institutional and high net worth investors, and fund management companies. Lai Kwok Kin, Founder and Managing Director of the WeR1 Group, said, "Many small-cap companies listed on SGX have solid fundamentals and strong growth prospects but are often overlooked by institutional investors. By showcasing these promising companies, we seek to help them raise investor awareness and generate sustained interest in the financial community. We thank SGX for their support and venue sponsorship." 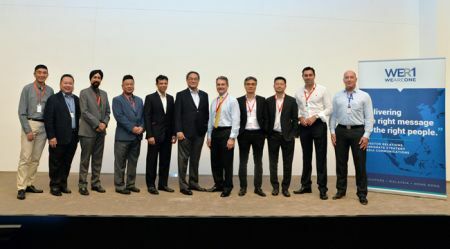 Mr Mohamed Nasser Ismail, Head of Equity Capital Markets SME and Head of Capital Market Development for SGX, and Mr Lai Kwok Kin, Managing Director of WeR1 Consultants (l 5,6), with senior management of the 6 featured SMEs.